Ask us about our rent special! Call (866) 760-6179 to learn more. Come home to the best in high-rise apartment living in Houston at Camden Post Oak and relish in sophisticated, luxury living in the Houston Galleria. What do you get with an apartment home on the 33rd floor, three bedrooms, two-stories and floor-to-ceiling windows? Penthouse apartment 3307! This three bedroom, two bathroom, 3,464 square foot apartment home towers above Post Oak blvd with breathtaking Houston city views. We know you'll never want to leave - that's why we have two year lease agreements available! Floor-to-ceiling windows and a private terrace that spans the dining and living room to provide breathtaking Houston skyline views. The gourmet kitchen has abundant counter space for food prep, a breakfast bar, a large kitchen pantry, double ovens, a stainless steel French door refrigerator, and quartz countertops accented by a subway tile backsplash. The kitchen flows seamlessly into the family room, showcasing a spectacular view of Uptown and Downtown Houston. The first bedroom suite has added privacy with a doorway separating the hallway of the bedroom from the living room. The spa-like bathroom includes quartz countertops, a large soaking tub and plenty of storage space. One flight of stairs opens to the second floor corridor creating private separation for the two remaining bedrooms. The expansive stair walls are perfect for an art gallery or your favorite photos! Need a home office? Dreaming of a mini-gallery in your home? Want to create a home gym? When it comes to the flexible study space off the stairs, you get to decide! The second bedroom is separate from the master bedroom suite with it's private closet, bathroom and floor-to-ceiling windows facing North Houston. Inside the master suite, you'll find flex space off the bedroom, a bathroom with dual vanity sinks, a separate walk-in shower and a closet that can finally fit all of your clothes and STILL give you room for more! Schedule a tour and experience this one-of-a-kind penthouse for yourself! Ready to make it yours? At Camden, your pets are family too! We welcome cats and dogs, up to three pets per apartment home, with a full-grown maximum weight limit of 75 pounds each. Call us with any pet-related questions! We'll save a spot for you! We offer one reserved covered parking space per apartment home. Select apartment homes include an attached garage and detached garages are available to rent. 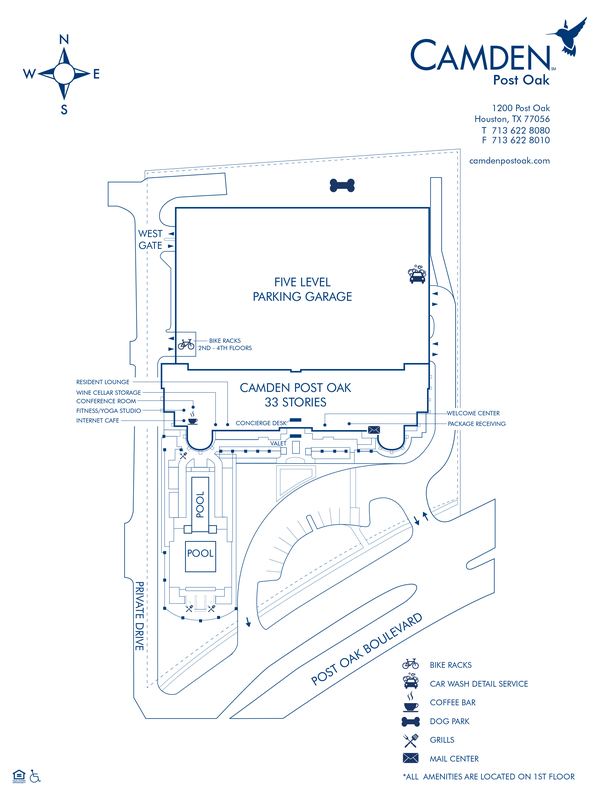 Visitor parking is located on the first floor of the parking garage with complimentary valet.